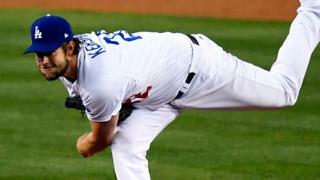 The Giants scored four runs (three earned) against Clayton Kershaw on Monday night as the Giants beat the Dodgers 4-3. Hunter Pence got the Giants started in the first inning with a two-run home run. The Dodgers were unable to provide enough runs to back Kershaw, who dropped to 4-2 on the season. It seems like all Dodger fans, including myself, assume that the Dodgers are guaranteed to win whenever Kershaw is pitching. The problem is that he is human so he has his bad days too. It seemed like the Dodgers assumed they would win on Monday night, and were caught by surprise when Kershaw struggled. In the first inning, Christian Arroyo singled with two strikes against Kershaw, he is now 3-6 against Kershaw with one RBI. The next batter, Hunter Pence, got a rare gift from Kershaw, a hanging breaking ball. Pence got his bat on the ball and Kershaw knew that it was gone immediately. The ball was caught by a fan in the left field pavilion and Dodger fans can only hope that he threw the ball back. The Dodgers attempted to tie the game in the first inning but scored only one run. Andrew Toles led off with a single, then Corey Seager walked, putting runners on first and second. Justin Turner flied out, advancing Toles, but not helping his hitting streak, which ended as Turner went 0-4 against Cueto and the Giants. Yasmani Grandal hit a ground ball to first base that Brandon Belt picked up and stepped on first for the second out. Belt then fired to second in an attempt to double-up Seager, but Seager was too fast, allowing Toles to score. Kershaw helped his own cause in the second inning with an RBI single. Cody Bellinger led off with a ground-rule double before Yasiel Puig flied out, and Chase Utley struck out. Kershaw then came to the plate with two outs and hit a single to left field. Bellinger scored just before Buster Posey applied the tag. The game was tied at 2. The Giants wasted little time in retaking the lead. Kershaw recorded two outs, then left a hanging breaking ball over the plate for Posey. Posey got the bat on the ball and drove it over the wall and into the Dodgers’ bullpen. The Giants took a 3-2 lead. The Giants tacked on one more run in the fifth inning, once again off Kershaw. Gorkys Hernandez led off the fifth inning attempting to bunt for a hit and Kershaw made an errant throw to first base, allowing Hernadez to reach safely and advance to second. Arroyo was the next batter and he pulled a fastball to left field, allowing Hernandez to score. The Giants took a 4-2 lead. The Dodgers attempted to make a comeback in the seventh inning but fell short again. Adrián González led off with a single, and Bellinger followed suit with another single. After Johnny Cueto recorded two outs, Chris Taylor hit a single to left field, allowing González to score. Cueto then got Toles to ground out, ending the Dodgers’ threat. Cueto pitched seven innings of three-run ball in what would be classified as a quality start. He allowed six hits and struck out six batters. The Dodgers got him into multiple jams, but he was able to get out of most of them without any trouble. Christian Arroyo has had more success than any other rookie has every had against Kershaw. He is 3-6 against Kershaw, giving him a .500 batting average. He has driven in one run and scored once against the Dodgers’ ace. Let’s hope he doesn’t go around telling everybody why he is so successful. Bruce Bochy was going to pull Cueto from the game with two outs in the sixth inning after Chris Taylor hit an RBI single, but Buster Posey wisely persuaded Bochy otherwise. The Giants have the worst bullpen in the Major Leagues, so to pull Cueto early would have been an early Christmas present for the Dodgers. Cueto got Toles to ground out and finish the inning without any more trouble. The Dodgers and their fans seem to think that the Dodgers are guaranteed to win if Clayton Kershaw is on the mound. Kershaw proved on Monday that he is just a human, not some baseball god. Don’t worry too much about it though, Kershaw responds well to a challenge and will be working hard to pitch much better in his next start. Let’s hope that he only has to wait five days instead of six this time. The Giants will send Matt Moore to the mound against Dodgers’ starter Alex Wood. The last time that Moore pitched at Dodger Stadium, he was one out away from a no-hitter when Seager broke it up with a single. Alex Wood is coming off one of his best starts in a Dodger uniform. It came against the Giants when he pitched six shutout innings at AT&T Park. The Dodgers are hoping that he will pitch like that again on Tuesday. The game will start at 7:10 pm PT and be televised on SportsNet LA.